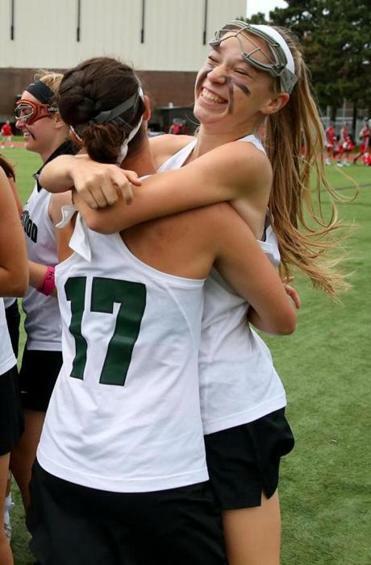 Lauren Norton, left, and Leah Nocera celebrate their Division 1 final win over Longmeadow. The Tri-Valley League MVP recorded 55 goals, 61 assists, and 45 draw controls and forced 23 turnovers to help Westwood capture the Division 1 state title. Egizi, who was a Tri-Valley League All-Star in soccer and hockey, will attend the University of Richmond in the fall. The junior center/attack led Norwell to the Division 2 South championship. Walsh was named a South Shore League All-Star and EMass first-team All-Star. She is also a two-time league All-Star in basketball. Walsh will play lacrosse for Holy Cross. Allard recorded 80 goals, 17 assists, 40 grounds balls, and 39 draw controls and forced 27 turnovers to push her career totals to 166 goals, 38 assists, 93 ground balls, 82 draw controls, and 74 forced turnovers. Allard is committed to play lacrosse for the University of North Carolina. The midfielder recorded 28 goals, 20 assists and 65 draw controls and forced 32 turnovers. She was named a Bay State League All-Star in lacrosse as well as hockey, where she led her team in scoring. Belval is committed to play lacrosse for Boston University. Chittick recorded 84 goals and 43 assists, helping North Andover capture the Division 1 North title. The three-time MVC All-Star and EMass All-Star was named MVC player of the year and is committed to play for Umass on a lacrosse scholarship. The midfielder notched 62 goals and 69 assists this season, becoming the is the all-time leader in points for Needham at 442. A 2013 All-American and a member of the National Honor Society, Conley will continue playing at Fairfield University. The senior ends her career with with 24 goals, 7 assists, 211 ground balls, 79 drawl controls, and 120 forced turnovers. Dachille is a three-time DCL All-Star in field hockey and a captain in field hockey and indoor track. She will attend Syracuse University. The sophomore midfielder was a first-team EMass All-American and Dual County League All-Star in leading the Patriots to the Division 1 East final. The 5-10, 150-pounder is also a member of Concord-Carlisle’s field hockey team. The senior midfielder is a three-time Bay State Conference All-Star and two-time All-American. Fitzgerald scored 325 career goals and is committed to play lacrosse for Johns Hopkins. She was also a Bay State All-Star in soccer and lettered in hockey and indoor track. The senior captain finishes her career with 75 goals, 178 draw controls, and 35 assists. She was named CAL player of the year and is a two-time league All-Star. Gillespie was also captain for the cross-country and swim teams. She will attend Bentley University. The Lincoln-Sudbury female athlete of the year recorded 72 goals in her final season. In her junior year, she was the team’s leading scorer and MVP. Guild is a two-time DCL All-Star in lacrosse and soccer. She will attend Harvard. As the team’s leading scorer, Hazar led Westwood to its third title in four years. She is a first-team All-American and a three-time TVL All-Star. Also a Division 2 state champion in ice hockey, she will attend the University of North Carolina. The goalkeeper was named team MVP this season. In her junior year, Kelly was named an All-American and a Globe All-Scholastic. Kelly also played hockey and soccer at Framingham. She plans on playing lacrosse for UMass Amherst. Lustig netted 36 goals her senior season to finish her career with 168. She recorded 19 assists, finishing with 40, and was a two-time Academic All-American. A two-time league all-star in both soccer and basketball, Lustig will attend Williams College. The center midfielder recorded 71 goals, 17 assists, 70 draw controls, and 28 forced turnovers, leading Reading to the Middlesex League championship for the first time in the program’s history. The three-year starter was named an first-team EMass All-Star this season. The senior attack had 37 goals, 14 assists, 26 ground balls, 33 forced turnovers, and 26 draw controls to help the Cougars reach the Division 1 South final. O’Connor is a 2013 All-American and first-team EMass All-Star. She plans to play for the University of Florida. The defensive midfielder is a two-time Dual County League All-Star and first-team EMass All-Star. Sennott finishes her career with a 2013 North championship and will play lacrosse for the University of New Hampshire, where she plans on majoring in occupational therapy. The co-captain recorded 53 goals and 25 assists, leading Duxbury to the Patriot League title in her final season. Smith finishes her career as a three-time Patriot League All-Star. The midfielder plans to play field hockey for Yale. Versprille registered 46 goals, 7 assists, 106 draw controls, 22 ground balls, and 24 forced turnovers in her final season, winning Hockomock League MVP. She is a three-time league All-Star who will play for Saint Anselm next year. Wurzer, a two-year captain, ended her high school career with a second straight undefeated season, second straight EIL championship, and second straight NEPSLWA All-Star game nod. Also a two-year captain on the hockey team, Wurzer will attend St. Michael’s College. In her fifth year at the helm, Kluge coached Wayland to a 17-5-1 record. The Boston College graduate led the Warriors to the Division 2 East title, defeating Medfield, 16-5. Wayland was also Dual County League co-champions. Prior lead North Andover to a 21-2-1 record this season, her first as head coach. The Scarlet Knights clinched the Merrimack Valley Conference championship with an undefeated league record. Prior also hoisted the Division 1 North championship trophy after defeating Winchester, 17-10, in the final. Atlantic Coast — Falmouth: Olivia Beaton, Madison Haberl. Marshfield: Elizabeth Ettridge, Sam Galler, Lexi Iafrato, Devyn Leahy. Nauset: Sam Berry, Tess Ropulewis, Julia Taylor. Plymouth North: Kelsey Frahlich, Kate Leavitt. Plymouth South: Allie Rogers. Sandwich: Lea Adams, Claire Gauthier, Maggie Layo, Caroline McKenna, Annie White. Bay State — Braintree: Ashley Russell. Framingham: Aileen Kelly, Kristin Wilder. Milton: Claire Mahoney. Natick: Julia Garrahan, Caroline Polymeros, Danielle Ranucci, Megan Tingley. Needham: Katie Belval, Catherine Conley, Kailey Conry, Annee O’Connor, Kira Oberle, Audrey Walsh. Newton North: Shannon Fitzgerald, Leah Howard. Norwood: Samantha Hayes, Kacie Smith. Walpole: Bri Doherty, Molly Lanahan, Michele Lucas. Wellesley: Korinna Garfield, Caitlin Mahoney. Weymouth: Samantha Coyle. Cape Ann — Georgetown: Grace Ann Conte. Hamilton-Wenham: Eliza Roberts. Ipswich: Claire Gardner, Olivia Moutevelis, Eliza Statile. Lynnfield: Paige MacEachern. Manchester Essex: Taylor Meek, Brittany Smith. Masconomet: Meghan Collins, Grace Fahey, Kathleen Gillespie. Newburyport: Julia Kipp, Ali Peffer. North Reading: Merissa Milano. Triton: Megan Muldowney. Catholic Central — Archbishop Williams: Heather Banks, Sharon Doherty, Marisa Gervasi. Arlington Catholic: Ellen Coholan, Danielle Kelley, Elizabeth O’Donovan, Marisa Opalinski. Austin Prep: Caroline Benson, Tori Bruce, Lauren Joyce, Grace McCarthy, Annie Richards. Bishop Fenwick: Merry Harrington, Tessa McLaughlin, Emily Rocker, Annette Ruggiero. Cardinal Spellman: Mickayla Roan. Lowell Catholic: Molly Cote, Courtney Lanier, Lexi Petzold. Marian: Annie Budra, MacKenzie Sparling. Matignon: Elizabeth Mahoney. St. Mary’s: Maggie Flaherty, Erin Mahr. Dual County — Concord-Carlisle: Hannah Dudley. Lincoln-Sudbury: Eliza Guild. Westford: Cathryn Sennott. Eastern Athletic — Bishop Feehan: Eliza Dietz, Caroline Flannery, Abby Roberts, Mandy Semple, Caroline Toomey. Bishop Stang: Emily Audycki, Ally DaCosta, Allison Lake, Kate Martin. Coyle & Cassidy: Kiley Adams, Shannon Largey. Martha’s Vineyard: Lee Hayman, Charlotte McCarron, Isabel Smith. EIL — Beaver Country Day: Caroline Hill. Berwick: Tatiana Bradley, Caroline Hernon, Melanie Mait, Cora Ordway, Kaitlyn Wurzer. Concord Academy: Nina Callahan, Winslow Ferris. Dana Hall: Jessica Hunnewell, Lucy Maloney, Attabelle Wasniewski. Lexington Christian: Emma O’Brien. Newton Country Day: Faith Carroll, Margaret Fee, Emily Hession, Sophia Sgroi. Pingree: Kirby Heffrin, Monica Manning, Eliza Mead, Mollie Smith. Portsmouth Abbey: Liv Mairs, Amberlee Majewski, Maddie Villareal. Winsor: Grace Carroll, Grace Hanrahan. Hockomock — Attleboro: Kerri Beland. Canton: Jackie Merrigan. Foxborough: Katie Notarangelo, Genne Rogan, Marybeth Sweeney. Franklin: Nicole Ellin, Emily Jeffries, Alex Mitchell, Meagan Schumauder, Marta Versprille. King Philip: Alicia Cuoco, Jen Lacroix, Julianne Piatelli. Mansfield: Lauren Beecher, Janet Maner. Milford: Gabrielle Vasile. North Attleborough: Hana Caster, Nicole Chretien. Oliver Ames: Megan Bosse. Sharon: Madison Tippett. IGC — Waring: Eleanor Lustig. ISL — Governor’s Academy: Kiley Coffey. Groton: Addie Ewald. Middlesex: Dakota Foster, Rowena Foster. Nobles: Colby Chanenchuk, Lauren Dillon, Mackenzie Kent. Rivers: Jamie Navoni. St. George’s: Cecilia Masiello. St. Mark’s: Hope D’Orsi, Tess D’Orsi, Mikaela Karlsson, Maddie Torgerson. St. Paul’s: Madison Crutchfield, Lindsey Reynolds, Rosemary Scalise, Caroline Zaffino. Thayer: Ivy Arlia. Merrimack Valley — Andover: Nikki Christopulos, Louisa Gross, Courtney Grygiel, Charlotte Lenes. Billerica: Amanda Burns, Erin Hatch. Central Catholic: Kelly Daigle, Jenna Palmisano, Deanna Savary. Chelmsford: Rachel Bossi, Micaela Sanborn, Baylee Stone. Dracut: Cassidy Diaz, Courtney Langlais, Rachel Santos. Haverhill: Alex Comeau, Brooke Martel, Jamie Martel, Abby Nauffts, Julia Rankin. Lowell: Morghan Cassella, Kelsie Christansen, Francesca Cigliano, Jessica Erickson, Elizabeth Mahoney. Methuen: Megan Bruneau, Ashley Horan, Shaley Horan, Aryanna Poirier. North Andover: Nicole Ayres, Leah Chittick, Lauren Hiller, Emma Johns, Abbie Karalis, Erin Kelley, Michelle Poirier. Tewksbury: Amanda Aylward, Taylor Lirakis, Hayley Sutherland. Middlesex (Freedom) — Burlington: Jordan Mathieson. Melrose: Katey Baraw, Anna Steele, Maddie Sullivan, Olivia Watson. Wakefield: Isa Cusak, Raina Langlois, Haley Riley, Raquel Riley. Watertown: Rachel Campbell, Allie Doggett, Emily Loprete, Ally McCall. Wilmington: Rachael Mara. Middlesex (Liberty) — Arlington: Mary Grace Cronin. Belmont: Sophia Eschenbach-Smith, Elisabeth Frick. Lexington: Fiona Fitzgerald, Jillian Jandl, Allie McNabb. Reading: Bridget Clements, Sarah Hart, Emma McDonagh, Jamie Melley, Kaitlyn Nugent. Winchester: Alaina Ewing, Laney Laghetto, Alexis Miller, Missy Riccio, Hallie Stone. Woburn: Morgan Bishop, Marilyn McCall, Nicole Pacheco. Northeastern — Beverly: Camden Vitale. Danvers: Meaghan McKenna, Rachel Trocchi. Gloucester: Tess Destino, Caity O’Leary. Marblehead: Sydney Cayen, Emily Freedland, Lucie Poulin. Peabody: Sarah Napolitano. Salem: Alexa Gilbert, Lydia Grasberger. Swampscott: Lauren Sullivan. Old Colony — Barnstable: Rachel Boule, Hannah Neary. Bridgewater-Raynham: Ali Daisy, Nicole Geragahty. Dartmouth: Ellie Gamache, Grace Gamache, Emily Quinn, Nicole Simas. Nantucket: Sam Freed, Olivia Slade, Frances Steadman. New Bedford: Alisha DeMello, Haines Duff, Caitlyn Mederios. Patriot — Duxbury: Riley Buonagurio, Jane Dudley, Katie Smith, Lily Smith, Jackie Sulllivan. Hanover: Molly McMahon, Brielle Prouty, Francesca Smiglianai, Emma Stone. Hingham: Abby Landry, Katie Landry, Jackie Murray. North Quincy: Molly Minton. Pembroke: Jane Morrisette. Quincy: Kayla McArdle, Gabby Zorkers. Scituate: Maria Garman, Maddie Gillespie, Erin Martin, Molly McCormack, Katherine Powers. Silver Lake: Emily Skerritt. Whitman-Hanson: Steph Hyslip, Steph Warn. South Shore — Abington: Erin Foley. Cohasset: Maddie Curley, Kathryn Dunn, Molly Fitzgerald, Taylor Frederick, Corey Golden. Hull: Alaina Bennett, Cassidy Dahill, Grace Ryan. Mashpee: Erica Caldwell, Jackie Lynch. Norwell: Catherine Connerty, Stephanie Croke, Kiley Decker, Catherine King, Jane O’Connell, Katie Reardon, Caroline Walsh. Tri-Valley — Ashland: Caitlin Graves. Dover-Sherborn: Holly Bertchsmann, Kate Masterson. Hopkinton: Julia Macchi, Taylor Sokol. Medfield: Abby Johnson, Caroline Tschirch. Medway: Katie Peters. Westwood: Kim Egizi, Ela Hazar, Kasey Keane, Brooke Troy.